A somber but reflective memorial service for victims of last month's Germanwings crash was held in Cologne, Germany on Friday, just a week shy of the one-month anniversary of the tragedy that took 150 lives. Nearly 1,400 mourners attended the service, which was held at Cologne cathedral in the heart of the city. The BBC reported that inside the cathedral, 150 candles — one for each victim — were lit and placed on the altar as those in attendance passed around small wooden angels, symbolic of "unity and faith". "We face not only sadness and pain but also the horror of peering into the abyss inside the human soul, even inside our human existence itself," said German President Joachim Gauck, who was joined by German Chancellor Angela Merkel and several French and Spanish ministers. Led by Cardinal Rainer Maria Woelki and Protestant pastor Annette Kurschus, the service attracted several hundred family members and friends of the deceased, as well as classmates of the 16 German students who were killed in the plane crash on their way home from a foreign exchange program. Some 50 German and French rescue workers, who had spent the last three and a half weeks sifting through the scattered wreckage, were also in attendance. According to the BBC, because many of the victims' remains have not been identified or given proper burial, the memorial service acted as a platform for loved ones to gather and console one another in their collective grief. "There was this unbelievable shock, this incomprehension, the sadness, which for many turned to rage and anger [after the initial crash]," said Gauck on Friday. "... Difficult times are when our people most pull together." Gauck also thanked the service and rescue workers for their efforts and for caring for the relatives of the victims as they stumbled into command centers in the dark hours after the tragedy. The tenuous atmosphere was held together by a chorus of sympathy for not only the families of the passengers and crew, but for co-pilot Andreas Lubitz, who supposedly steered the plane into the French Alps in a suicide attempt, and his loved ones. "We don’t know what was going on inside the head of the co-pilot in the decisive second, in the decisive minutes," recounted Gauck, "... [but] we do know that his family also lost someone they loved on March 24." Added Cardinal Woelki, in response to the decision to light a candle on the altar for Lubitz, "It's not for us to judge." Outside the cathedral, throngs of mourners gathered to watch the service on big screens and to place flowers around a small platform memorial near the steps of the church. One German mourner told the BBC that "it was in the Christian spirit to forgive", and that every candle, including Lubitz's, was deserved. Inside, families and friends of the victims were given small solace in various musical dedications by Romanian soprano Luiza Fatyol, who offered a rendition of Gabriel Fauré's "Pie Jesu" in honor of two fellow opera singers killed in the crash, and three Haltern-based musicians, who played the theme from the movie "Schindler's List" in memory of the 16 exchange students. Germanwings Flight 4U9525 was on its way from Barcelona, Spain to Düsseldorf, Germany when it crashed in the French Alps outside of Nice on March 24. According to investigators, co-pilot Lubitz had allegedly locked Captain Patrick Sondenheimer out of the cockpit when Sondenheimer left to take a bathroom break, and manually steered the Lufthansa-owned Airbus A320 into the mountainside at full-speed. All 150 passengers and crew aboard were killed instantly. Authorities are still searching for a concrete motive. 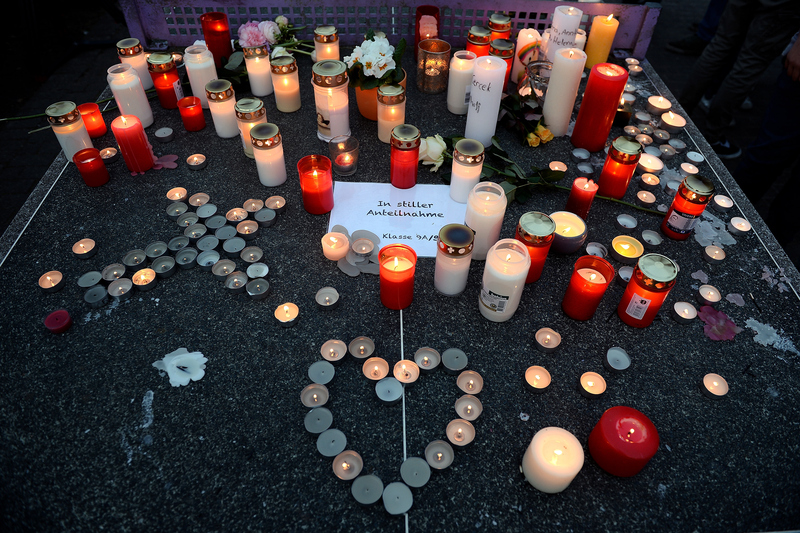 But while they work to figure out what exactly caused Lubitz to take down the aircraft, Gauck told mourners on Friday, loved ones of all aboard the fateful flight would be able to gather with a network of supporters and fellow grievers in their slow recovery. "You are not alone in these hours of loneliness," said Gauck.